General mold inspections are normally requested by home or building owners who may have no specific reason to suspect mold growth, but may suspect such due to experiencing vague health symptoms, occupant complaints, the presence of suspect odors, physician request, etc. In some cases the owner or occupant may have a specific area of concern or may just want a complete home or building inspection. Roof leaks, condensation buildup, and plumbing breaks may provide the opportunity for blooms of molds/fungi and bacteria. Inhalation or contact with these organisms can have serious health effects. Long after the water and the visible damage is removed, the mold growth and resulting spores of these microorganisms can remain in the home or building unless proper actions are taken at the time of cleanup. A general mold inspection should involve, at a minimum, a thorough visual inspection of all areas or designated specific areas of the home or building with extra attention paid to those areas with water piping and water use (kitchens, bathrooms, walls containing water/sewer piping, etc.) looking for indications of water intrusion (staining, paint blistering, finish delamination, water induced deterioration, etc. 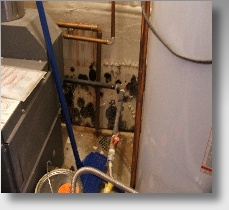 ), past flooding or actual visible mold growth. The visual inspection should include testing suspect areas with a moisture meter to determine the presence of moisture at levels that could support mold growth. Following the visual inspection samples of suspect growth or areas suspected of containing growth may be collected to confirm the presence of mold. Sampling may include direct sampling of a suspect mold colony, general surface sampling to determine the mold burden and/or air sampling to determine the presence of elevated levels of mold particulates (spores, hyphae, etc.) in the air. CERL can provide complete inspection and sampling services to determine mold presence and location in the home/building. The inspection report also provides recommended remediation methods and techniques specific for the project.